On Twitter yesterday, I asked if my Irish friends had ever heard of Sloppy Joes, suspecting (correctly) that they’re an American thing. A lot of people had heard of them but weren’t quite sure what they were. “Are they kind of like a burger?” “A messy meatball hero?” “Isn’t it just Bolognese on a bun?” The Americans, though, all had the same response — that they were an old childhood favorite. One fellow expat got a little confused and thought I’d never heard of them, saying, “What kind of tragic American upbringing did you have? !”, while another said, “Dammit, now I’m going to crave them for three days, and I haven’t eaten beef in 20 years.” Clearly, the Irish don’t know what they’re missing! The tradition continues in my house now — whenever I ask my daughter what she’d like me to make for dinner, she invariably either says Sloppy Joes (must be that kids and ketchup thing again) or this pasta with bacon, peas and cream. 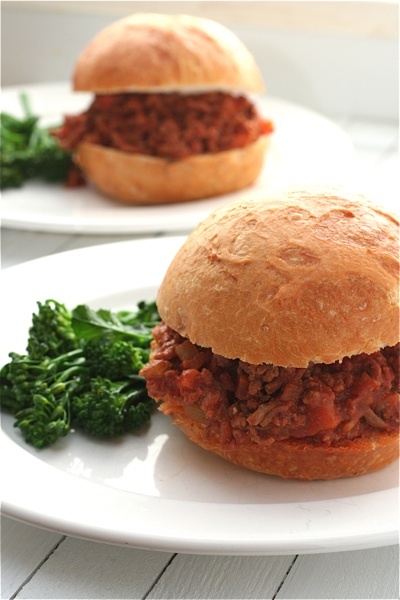 When I think of what to serve with Sloppy Joes, I tend to gravitate towards summery sides like potato salad or coleslaw, or even that classic American sandwich accompaniment — potato chips — but most of the time I try to be a good mom and get more veg into my kids, so I’ll serve them with something like steamed broccoli. Finely chopping the vegetables is my way of making sure my kids actually eat them — if they’re tiny, they can’t pick them out and leave them behind on their plates. For a lighter version, try using minced turkey instead of beef, as in Tyler Florence’s recipe. In the Twitter conversation about Sloppy Joes, Theresa commented that she might try making a more grown‐up version by adding some smoked cheese, which got me to thinking that a chipotle version would be damn good too, though probably not as kid friendly. Heat the olive oil in a large pan on a medium heat. Add the carrots, onion, red pepper and celery. Cook for 10 minutes, until the vegetables have softened (add a pinch of salt to stop the onion from browning). Add the minced garlic and cook for 1 minute more. Remove the vegetables from the pan to a medium‐sized bowl and set aside. Using the same pan (or you can cook the meat at the same time as the vegetables in a separate pan to save time), raise the heat and brown the beef. Strain off all but 1 tablespoon of the fat from the bottom of the pan. Return the vegetables to the pan. Add the tomato sauce, ketchup, brown sugar, Worcestershire sauce, vinegar and thyme to the pan. Stir to mix well. Lower the heat to medium‐low and simmer, partially covered, for at least 10 minutes or up to 30 minutes. Season to taste with salt and pepper. Spoon on top of toasted hamburger buns, Kaiser rolls or baps and sprinkle some grated cheddar cheese on top. Pass around the napkins and don’t worry about making a mess, or serve as an open face sandwich instead and dig in with a knife and fork.